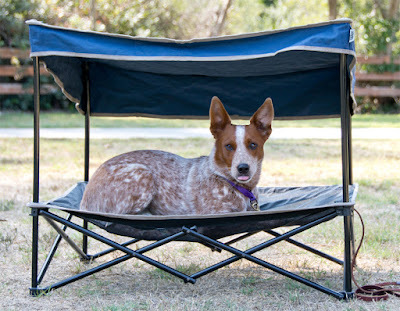 The Quik Shade is basically the tube chair version of a dog bed. You know those folding camp chairs that slide into a long skinny bag? This thing works the same way. 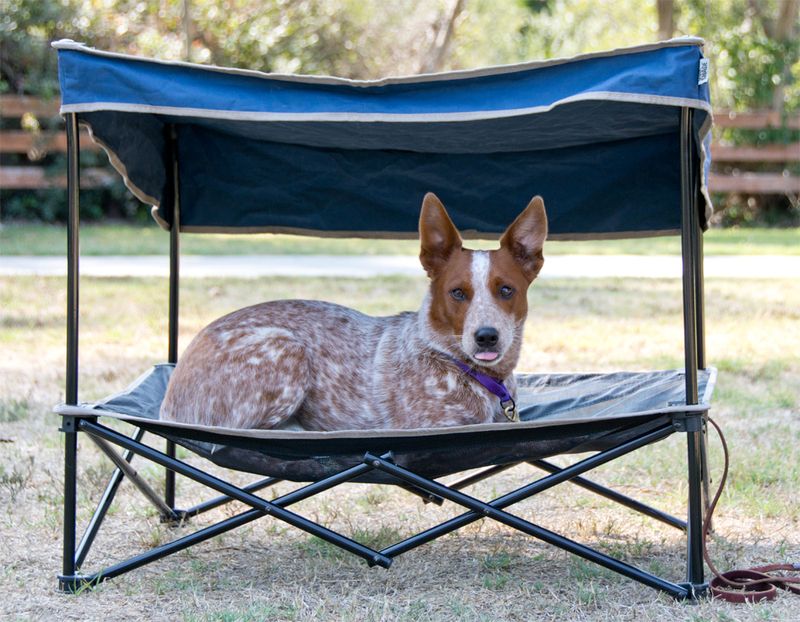 It's an elevated mesh dog bed with a solid canopy above to provide shade. The whole thing folds up into a surprisingly small package. The Quik Shade comes in three sizes, there is also an enclosed version with mesh walls to keep bugs out and your dog in. Do you and your dog spend a lot of time outdoors? Do they need a comfortable and non-absorbent place to chill after a swim? A cool place to rest at work or while visiting friends? The Quik Shade was made for you. The bed portion is basically a mesh hammock, it allows a lot of air to circulate under your dog. The top provides some solid shade, and it's angled a bit so you can position he bed for maximum effect. The comparison to a folding camp chair seems to be entirely appropriate. It's built the same way, out of the same materials, and seems to be intended for the same sorts of uses. That is to say, this is a portable piece of furniture that you take along with you on an outing, and then put away in your garage when you get home. I've read some reviews by people that reported the canopy disintegrated after being left outside in the sun for months on end. You know what else does that? Folding camp chairs. It's not a piece of patio furniture designed to last years in the sun. Does that make sense? Pros: Provides an instant cool and shady spot. Very portable. Non-absorbent, perfect for wet dogs. Cons: About as sturdy as a mid-range folding camp chair, not top-of-the-line, but better than a $5 Walmart tube chair. Prone to fading in the sun eventually. Customer service for this company appears to be lacking. Bottom Line: I found our QuikShade at a thrift store. I had no idea such a thing existed.